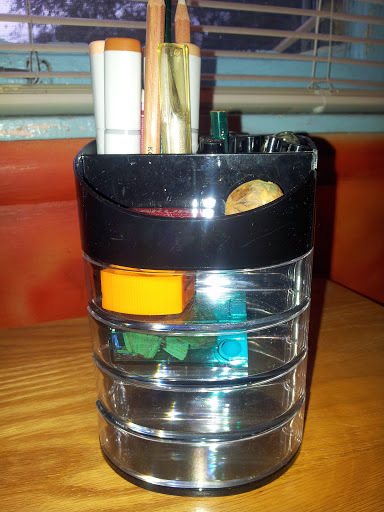 Little drawers for erasers and pencil sharpers. Slim, compact, and easy access. You need paper to draw on, naturally. 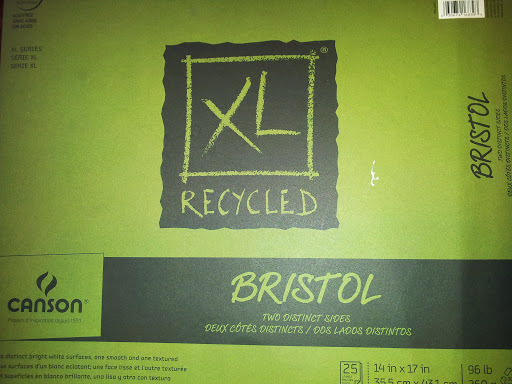 Personally, I am enamored with Bristol paper. Matter-of-fact, I'm kind of obsessed with it. Before I used regular premium drawing paper. Then I discovered that the stock of Bristol paper works better for me. I like it because it works well with the crafting aspect of many of my drawings. Plus, there's just something reliable about this type of paper. Its hardness appeals to my drawing muse (^_^). This particular pad is from recycled paper, which is always great to pick from to "do your part". Nothing but gentle block style erasers work for me during the sketching process. You definitely don't want to use anything super abrasive like Pink Pearl. White, clean, and gentle is the way to go. The same applies for the eraser pen that helps with small lines. 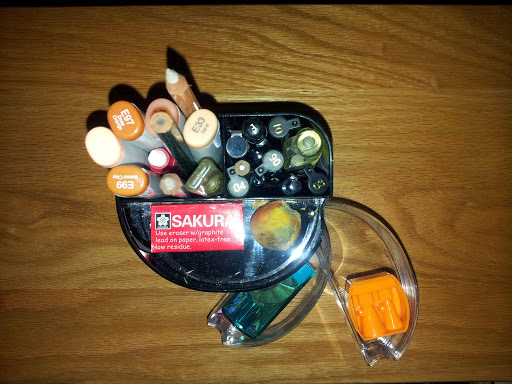 I have two pencil sharpeners. One seems to work better with the color pencils I use while the other for regular drawing pencils. 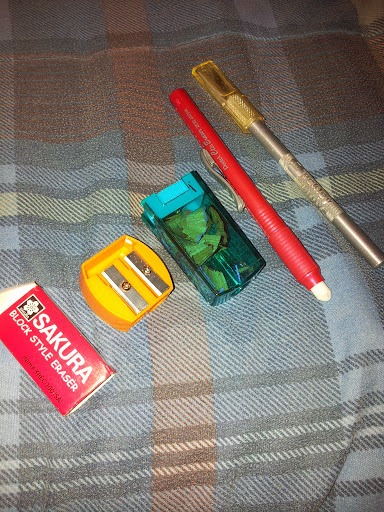 Other than that, I lose sharpeners a lot. Because I mix drawing with crafting, I also have an X-Acto Knife handy. You'll soon see why. The start of every sketch: pencils. 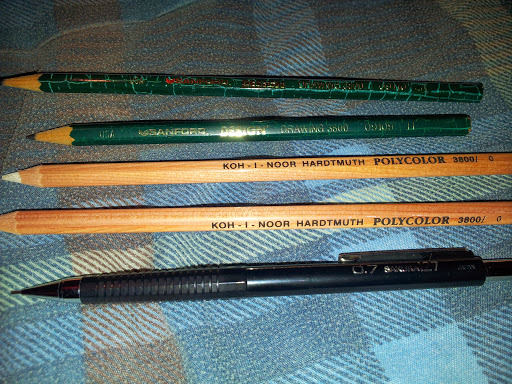 With the exception of the two blending pencils (those with the white tips), I use the lightness of H and 2H pencils. Something like 2B or beyond 2H is entirely too harsh for me. The difference is the lead in the pencil. The higher the number and letter combination, the stronger the lead is in the pencil. So H and 2H has a softer lead material than something like a 9H drawing pencil. You could say that I like to sketch almost invisibly, but I'm always mindful of possible lines dug into the paper because of hard sketching. 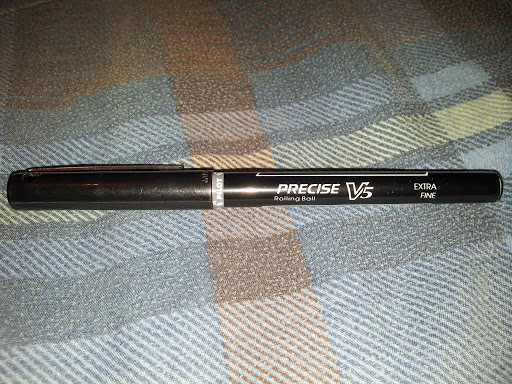 While I do have a mechanical pencil shown here, I rarely use it. I love my wood and lead combo. Therefore, H and 2H remain my favorite sketching pencils. Time for ink. But first I should share something you should be aware of before you move from the sketching stage: LOOK AT YOUR SKETCH THROUGH A MIRROR! That's right. Take your sketch and look at it through a mirror. Through its reflection, you will see just about every uneven line, swoop, or curve that your eye doesn't catch otherwise. I learned this a long time ago. It works especially for someone like myself who loves to draw portraits of pretty manga-inspired characters. Nevertheless, I wouldn't be so hard on myself should I miss something. Sometimes you got to let mishaps be. 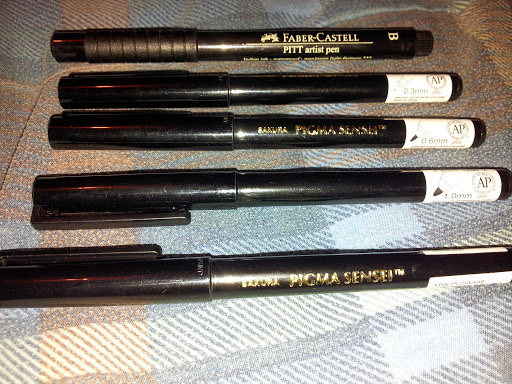 This here is a small collection of the ink pens I use after a sketch. I do have a calligraphy pen that holds speedball types A, B, C, D. It's fun dipping into India ink, but I haven't used it in a while because I don't care too much for the grip. It's not too necessary. This set here is helpful because each tip provides a different gradient for what you want to achieve in your drawing. If you want a really heavy line, you'll use a 1.0mm sized pen. A little thicker? Try the 0.6mm pen. The Faber-Castell pen at the top uses India ink and its marked with B for Big or even Bold. Because I bought this brand in a kit, there is also an M for Medium and S for Small and XS for Extra Small. ...this one! I got a close snapshot of the name and style. You can take a note and buy it at Wal-Mart (that's right) in a two-pack deal. This pen is amazing. For someone who sketches neatly and inks just as neatly, this pen saved me a lot of headache because I don't color as neatly. The tip is so fine, so precise (as the pen states), that it just makes your inked sketch look so delicate and clean for color. I could go on and on about this pen, but I won't. A funny observation I noticed is that it dries slower on paper than a lot of the other pens I mentioned. Therefore, give yourself a second after inking to erase pencil lines. 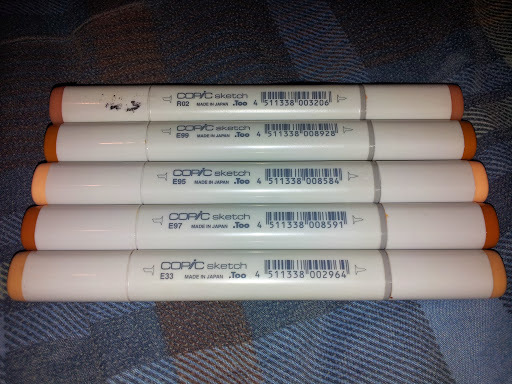 Everybody who is inspired by manga art knows about Copic Sketch markers shipping over from Japan. People use either Copic or Prismacolor. I own a few of both, and yeah, Copic is probably my most preferred. Why? Mainly because they don't dry up nearly as fast as Prismacolor and they are superior for blending with my other coloring methods. That's just my experience, though. Needless to say, both brands are expensive--and rightfully so considering how amazing they are. Thankfully, I don't use either to color my drawings (the next post will be dedicated to my coloring methods), and that's not because I am too cheap. I'm simply not a fan of using markers to color entire drawings. I don't like the back-and-forth of markers over wide spaces, if that makes sense. With all that said, I own only flesh-tone Copic markers that I use for shadowing and outlining characters. 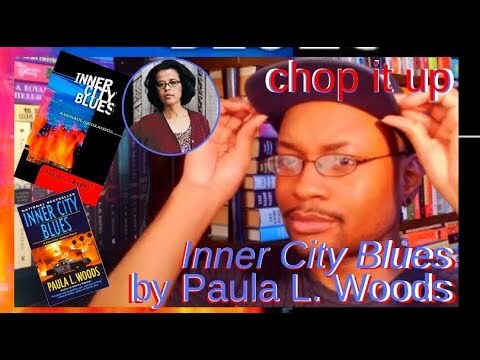 I'll be sharing this in the next video. 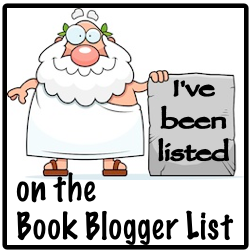 Thanks to those who read all of this and please feel free to share any ideas, methods or drawing tools.